Ah, Spring is nigh, and with it, the promises of warm weather, sunny days, and…a really hot house. This is especially true for us in Hillsborough County, Florida, where the summer heat can be sweltering on a good day, and downright oppressive on a bad day. Although summer isn’t quite here yet, it’s coming, and it’s good to prepare for it during your spring cleaning. Spring cleaning is a ritual to many, but for most, it just involves clearing out old junk, reorganizing, and, well, cleaning. If you were to ask the average person what their main priorities are for spring cleaning, “calling an HVAC professional to service to do a checkup on the air conditioner” probably isn’t at the top of their list. Spring and summer allergies are extremely common. If you’re a victim of their shenanigans, did you know that you might be making the problem worse by neglecting your air conditioner? Indeed, through seasons of excessive use (read: winter), it is quite common for allergens to accumulate in your air system. Throughout the summer, these will circulate through your house, exacerbating a problem that’s already annoying to deal with in the first place. Dust, mold, and other malicious particles just love hanging out in your air flow system, so it’s important to take preemptive action before they come back to haunt you when it’s most inconvenient. That’s why you should call your nearby HVAC contractors; cleaning out the allergens is an essential part of air conditioning repair and general maintenance. One of the most obvious arguments in favor of an HVAC checkup is the idea that, yeah, you won’t want to face the heat of a Florida summer on your own. If the temperature alone doesn’t get you, the humidity will, and you don’t want to find yourself lying in a puddle of your own sweat wondering why you didn’t just fix the AC when you had the chance. 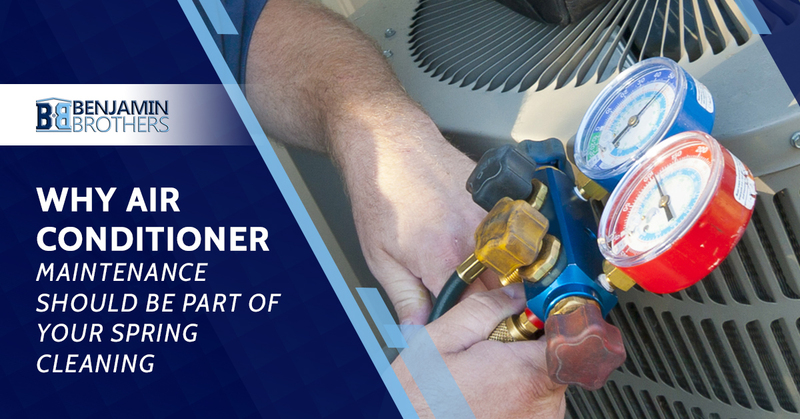 You may think that air conditioning maintenance is unnecessary because your HVAC currently operates just fine. In this assumption, you’d be wrong. Even if your air conditioner works now, there’s no guarantee that it will two months from now, especially after strained usage. The bottom line is that a spring cleaning checkup from professionals can help to diagnose and treat any potential problems that your HVAC might be harboring. These things can sneak up in the middle of the season if you don’t get them checked. It’s better to prepare your air conditioner for the busy season ahead, dramatically increasing your odds of having a breakdown-free summer. As professional HVAC contractors in the Hillsborough County area, we have horror stories about the lack of maintenance we’ve seen on people’s air conditioning systems. It’s a common assumption that, once your HVAC is working, you never need to touch it again unless it breaks down. In fact, a breakdown is much, much more likely when you’re not servicing your air conditioner frequently. Air conditioning repair and maintenance shouldn’t just be a spring cleaning thing — you should be doing it on the regular! When was the last time you changed out your air filters? When was the last time you had a professional look at your air conditioning system? When was the last time you invested some money into the general maintenance of your HVAC? If it’s been so long that you’re having trouble remembering the answer, then it’s probably time to call some professionals. Don’t put it off — be prepared for this summer by calling your local HVAC contractors to do a check-up on your HVAC. Whether it’s air conditioner repair, cleaning out your vents, or just general preventative maintenance, you won’t regret making the call. If you’re in or around Hillsborough County, our team at Benjamin Brothers would be happy to do such a checkup for you. With over 20 years of experience, we know exactly what every HVAC system needs, and we’ll make it our top priority to provide that for you, along with out-of-this-world customer customer service. Contact us today for a free estimate!